There are many different types of love and, at the same time, love can really just be love. You can categorize it and associate other emotions to it based on the person toward whom you experience your love. The experience of loving and being loved unconditionally, however – on whatever level – is one that is essential to our human growth and sense of wellness. 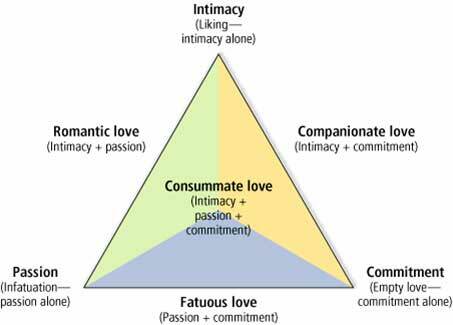 In his Theory on Love, Sternberg speaks of 8 types of love that are built on three main building blocks: intimacy, passion, and commitment. According to his theory, Comsummate love – where all three ingredients are present – is the ultimate combination for a successful long-term partnership. Sternberg’s model sheds a lot of light on the different choices people will make in their life as a couple. Lately, I have been thinking a lot about love beyond the scope of just couples, however. Friendships, family members, acquaintances, neighbours, co-workers, and self-love are all relationships in which love can be experienced in different ways. Sometimes, the appropriate kind of love simply entails being caring, respectful, and mindful. It’s still love and it’s still something that we all need and desire for our happiness. What has really struck me lately, is the fact that there are people in this world who don’t know what that experience of being loved unconditionally really feels like. Or, when it is present, some have no idea how to allow it to just be and receive it. When I am working with people in the context of counselling, it doesn’t matter what the initial concern is that brought them to seek help in the first place is. It almost always boils down to a complaint about a relationship in their lives that is lacking the kind of love they desire. Or, the complaint may simply be that they don’t have an experience of love in any of their relationships. The complaint may be a deep sense of loneliness. It is in this sense that I equate love to happiness and belonging. We are social beings and our way of relating to ourselves and others is really the only thing we have to base our experience of life on. Think about the conversations you have with friends and family. Are social relationships and a desire to be liked, loved, and understood not at the forefront of what we all tend to spend some of our energy on? If we refer to the Yoga Sutras of Patanjali (yogic text), the causes of suffering, or kleshas, are all rooted in the notion of wrong perception (avidya). Meaning, when suffering is present, there is a discrepancy between reality and the way one perceives reality. This wrong perception, when we are taking about love and suffering, may boil down to a mistaken interpretation such as “I am unlovable”, “no one will ever love me”, “something must be wrong with me because I can’t get the kind of love I want”, “people always leave me”, “I hate people for what they have done to me”, “I can’t ever trust anyone to truly love me and be trusted with my love”, “I will never risk loving again because people hurt me”, “I can’t let him/her go, because I don’t want to be alone”, “love isn’t real”, “I have given up on believing in love”. Referring to the causes of suffering again, the ego (asmita) is an influential part of the way in which the individual interprets his or her experiences. Whether it is based on an attachment or desire (raga), on fear (abhinivesa), or on an aversion to something that we don’t want to re-experience (dvesa), our ego values being right and making others wrong. Our ego will seek protection, and this is where our wrong perceptions and interpretations of who we are can actually get in the way of having the love that we need and want. Take a moment today to reflect on love. Drop out of your thinking mind and experience the love. After all, love is all you need. For some, that comes easily. For others, it takes work in peeling away all the layers of mistaken beliefs that would allow love to be.